Stainless steel punch holes sheet refers to a perforated stencil made of stainless steel. There are many advantages to using perforated plates made of stainless steel. The main advantages are: smooth, smooth, beautiful, durable and wide-ranging. 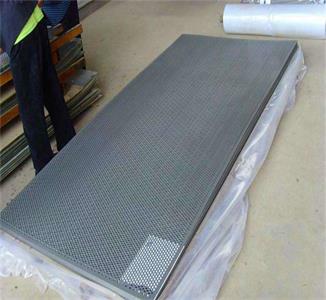 Stainless steel punch holes sheet is also known as punching net, perforated plate, perforated plate, mine screen, machine screen and so on. As the name implies, the metal plate products with various shapes of holes on the surface are widely used in chemical machinery, pharmaceutical equipment, food and beverage machinery, cigarette machinery, harvesters, dry cleaning machines, ironing stations, silencers, refrigeration equipment (central air conditioners). , crafts production, paper, hydraulic parts, filtration equipment, and other industries. Hole type rectangular hole, square hole, diamond hole, round hole, hexagonal hole, cross hole, triangular hole, oblong hole, long waist hole, plum blossom hole, fish scale hole, pattern hole, pentagonal star hole, irregular hole, Drum holes, etc. 4. stainless steel material excellent corrosion resistance, acid, alkali, salt corrosion, can adapt to the special requirements of oil wells, the gap will not gradually become larger due to corrosion. 5. The multi-layer structure is welded integrally, which makes the filter hole stable and has strong anti-deformation ability.The outer protective sleeve can also be screw welded. Jawaysteel Corporation,stainless steel sheet supplier from China,founded in 1998, is a professional manufacturer and global exporter specializing in metal manufacture and exportation. In recent years, winged by rapid merge and expansion,Our well-equipped plant emerged in Dainan, Jiangsu Province, with two Export offices respectively located in Shanghai and HongKong catering.Export offices respectively located in Shanghai and HongKong catering to a lager scale of customers from both home and abroad under the banner of supreme service.